Signed by artist, giclee, all archival supports and pigment-based ink. No aircraft symbolizes trans-oceanic luxury travel better than did Pan American Airways’ Boeing Model 314 Clipper flying boats. The Boeing design was the result of a design request from Pan American for an aircraft which could be profitable on its long Pacific routes which stretched across the Pacific to Hong Kong, the Philippines, and New Zealand. To do this, the new aircraft would need to be far larger and faster than its predecessor, the Martin M-130. Pan American ordered twelve Boeing Clippers, the prototype was named the Honolulu Clipper for the name of the first port of call out of its home base at Treasure Island, near San Francisco. With a wingspan of 152 feet and a length of 106 feet, the new Boeing Clippers were extraordinarily large aircraft for the time. They were capable of carrying a crew of eleven and as many as seventy-four passengers in luxury plus 10,000 pounds of mail and other cargo. The loaded weight (84,000 Lbs.) of the Clipper was almost double that of its dry weight. Four of the most powerful radial engines available at the time, the Wright R-2600-3 Double Cyclone engines, rated at 1600 hp apiece provided the Clipper with a cruise speed of 188 mph, and a range of 3,685 miles. The Honolulu Clipper began its Pacific Route service in January 1939, flying between San Francisco and Hong Kong. Unlike today’s air travel with its frenetic pace, crowded uncomfortable seating, and irritating extra charges for anything, and everything other than a place to sit, the Clipper was slower-paced and utterly luxurious. Hotel accommodations at Pan American-owned hotels at way-points along the route were part of the package. Pan American had hardly gotten started on its Boeing Clipper trans-Pacific service when World War Two intervened, closing down passenger service across all of Pan Am’s overseas routes, and the requisition of all of the big Boeings by the military for war service. Winston Churchill and Franklin Roosevelt both were passengers aboard these huge flying boats during the war, Churchill even was allowed to do some of the flying. Roosevelt flew across the Atlantic aboard the Dixie Clipper to the Big Three conference at Casablanca, celebrating his 61st birthday on the return trip. This was a first time that a US president had traveled across an ocean by air. After the war, the era of the big flying boat had ended, giving way to less-expensive land-based transports, which were faster and much more economical to operate. 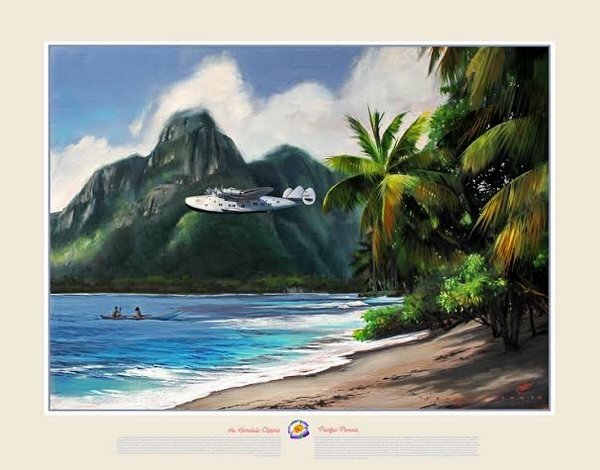 In the oil painting above we see a romantic view of the Honolulu Clipper as she lifts off of the water from a South Seas way-point on her way to Hong Kong.